A technically advanced long-range cruising yacht with a detailed, luxurious interior, the new Princess is a production yacht with all the allure and trimmings of a custom build. She was the perfect step forward for a long-time Princess owner. Owners come to production yachts because they offer confidence. They have been tried and tested, and for any first-time boat purchaser, faith in a product is an important factor. 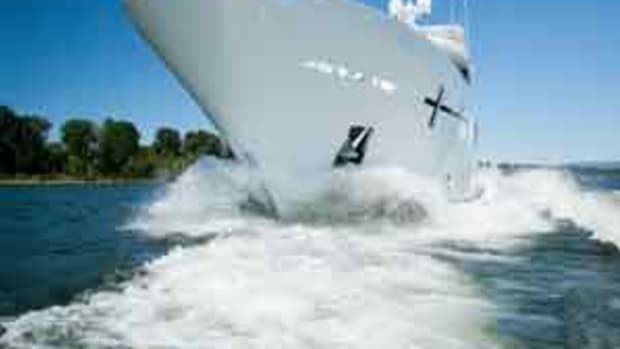 What many owners do not immediately grasp as they take the helm of their 40-foot entry-level cruiser, is that by buying a production-built boat, they are generally buying into a company brand-loyalty scheme. Yachtbuilders nurture this innate family feeling and encourage owners to progress through their range. Each time, owners buy bigger, better and, of course, more expensive models. For the yachtbuilder, it is a business model that works well, and it satisfies the needs and desires of owners who do not seek to stray into the world of the custom build. But what do you do for the owner who, having reached the top of the range, wants to move onward and upward? 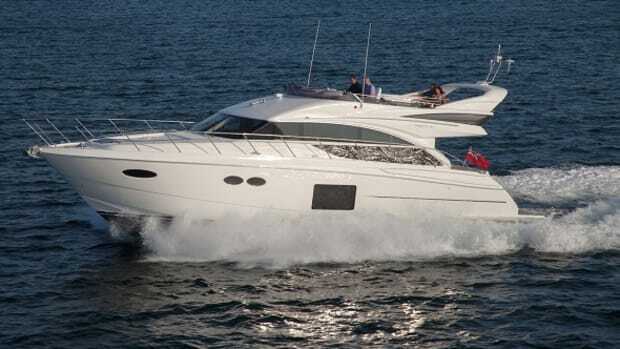 As it is for so many other production boatbuilders, the answer for Princess Yachts was easy. You build him a bigger one and enlarge your range at the same time. So it was with Peter Levine, the 55-year-old chairman of a London-based oil exploration company whose main area of activity is in Siberia. His first Princess was a 66-foot model purchased in 2000. In the 12 years that followed, he has worked his way through five Princess yachts, each one bigger than the last. 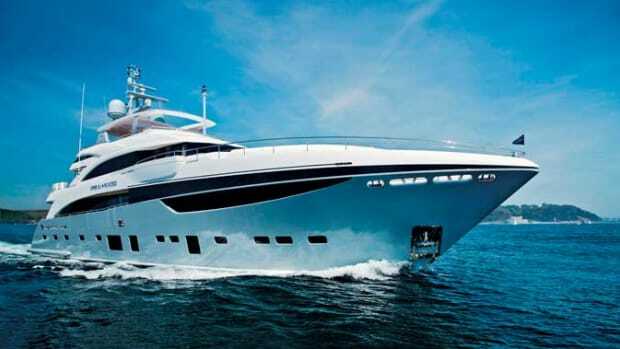 It was in 2009 while he owned a 95-foot Princess that he first saw the plans of what the builder was calling 40M, a 132-foot semicustom boat. 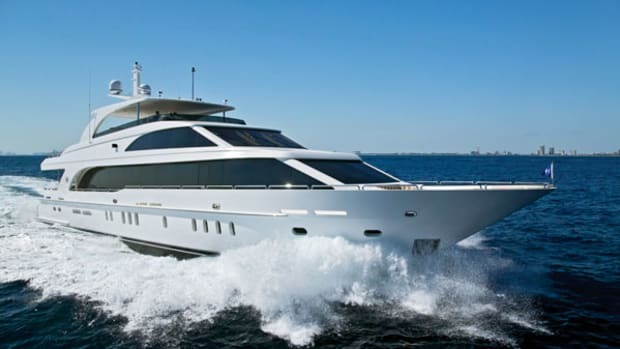 Flush with money from their then-new owners, LVMH, the yachtbuilder had the investment it needed to enlarge the range and, with a customer ready to sign, they had everything they needed to turn planned construction into reality. 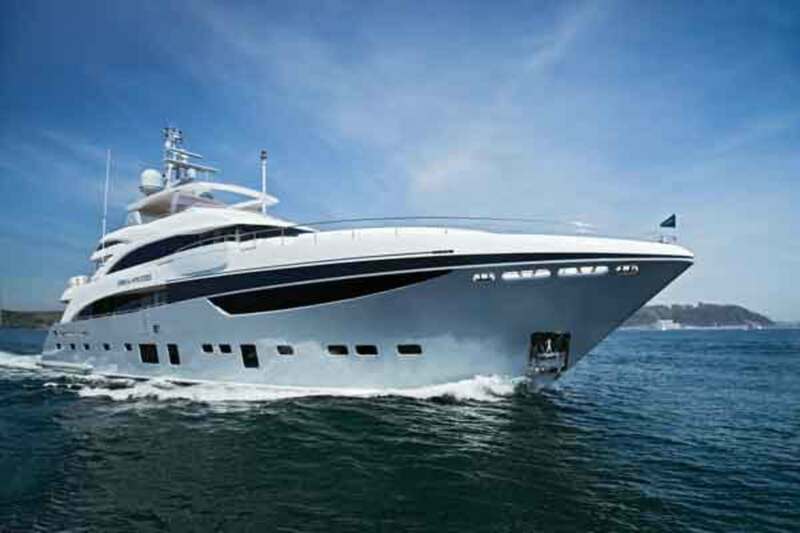 Based in Plymouth, in the southwest corner of Great Britain, Princess Yachts began work on its superyacht range, building a new 105-foot boat at the same time as the 132. The smaller boat, the Princess 32M, was launched at the London Boat Show in 2011 and the bigger yacht—by then christened Imperial Princess after the owner’s oil company, Imperial Energy—was first publicly seen at the Cannes boat show in September 2012 and later that month at the Monaco Yacht Show. Described as a long-range cruising yacht, this new boat is more technically advanced than the company’s previous offerings. 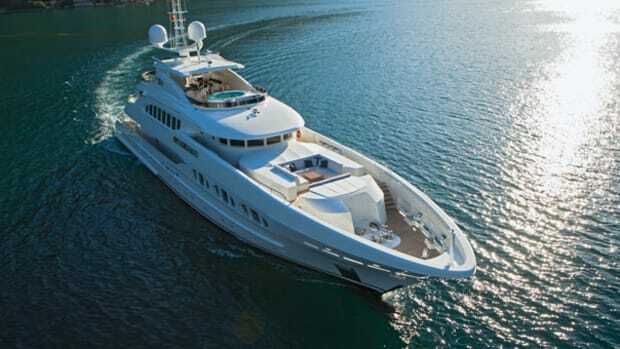 More than 200,000 man-hours went into the yacht’s development and build. The resin-infused hull has an area of 5,640 square feet and utilized 24,574 square feet of composite material during the construction process. The huge expanse of interior and exterior living space can comfortably accommodate up to 12 guests who are served by a crew of seven in complete privacy. London-based designers Bannenberg & Rowell were involved with the planning of the interior and the way the space was eventually utilized by the builder’s own in-house design team. 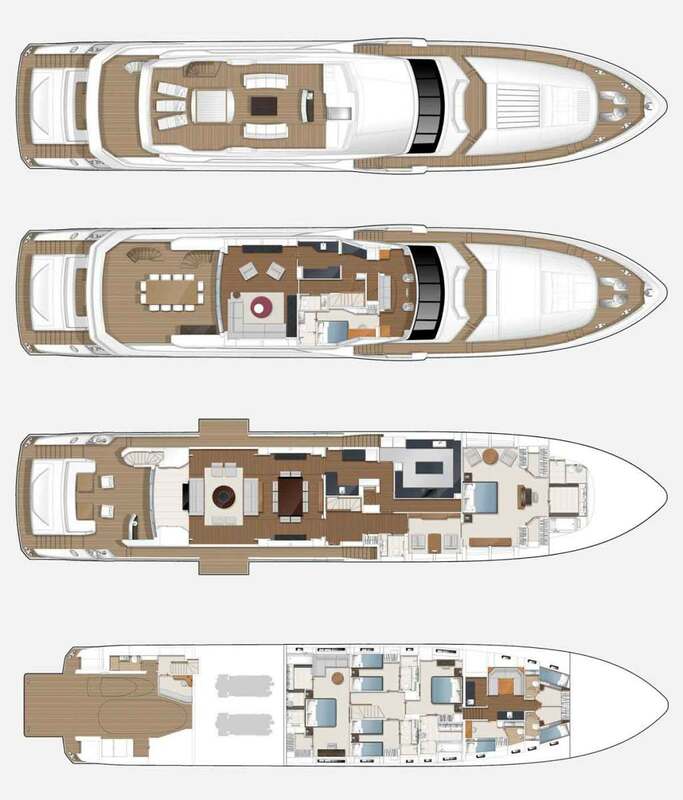 The yacht’s sleek exterior look somewhat disguises the tri-deck yacht’s enormous interior, which offers considerably more volume than many competitors of the same length. Levine, who backed the project early on, was able to drive some of the design directives. 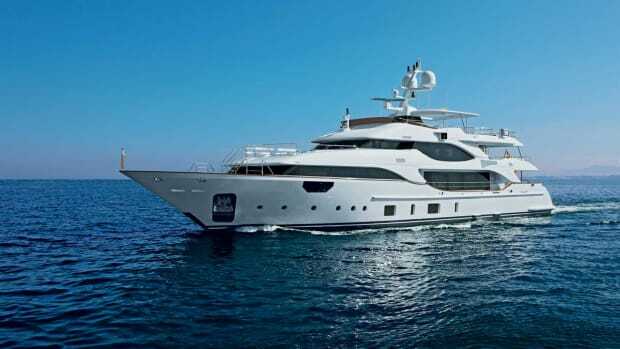 Famously, he told the design team he did not want a yacht that “looked as if it was a flybridge model on steroids.” Clearly they listened because the uppermost deck is truly a sun deck, although the builders will offer it with the option of a helm station in future builds. Drop-down balconies were used to widen the beam in the main salon, creating a spacious area for entertaining and relaxing. Sofas and club chairs cluster around a beautifully crafted circular coffee table made from ebony in the shipyard’s woodworking shops. When the doors are open and the balcony is in the drop-down position, the patio-on-the-sea effect is dramatic. As a result, guests seated in silk brocade–covered chairs (sourced from Davidson) at the almost square table in the formal dining area enjoy extensive views through panoramic windows. Artwork adorns the main salon area. An etched-steel screen specially made by Christofle in Paris, which embellishes the forward bulkhead, faces another screen aft. Fabric designer Luc Druez made this one—an intricate, glass-encapsulated weave of copper, anthracite and silver wire—exclusively for the yacht. 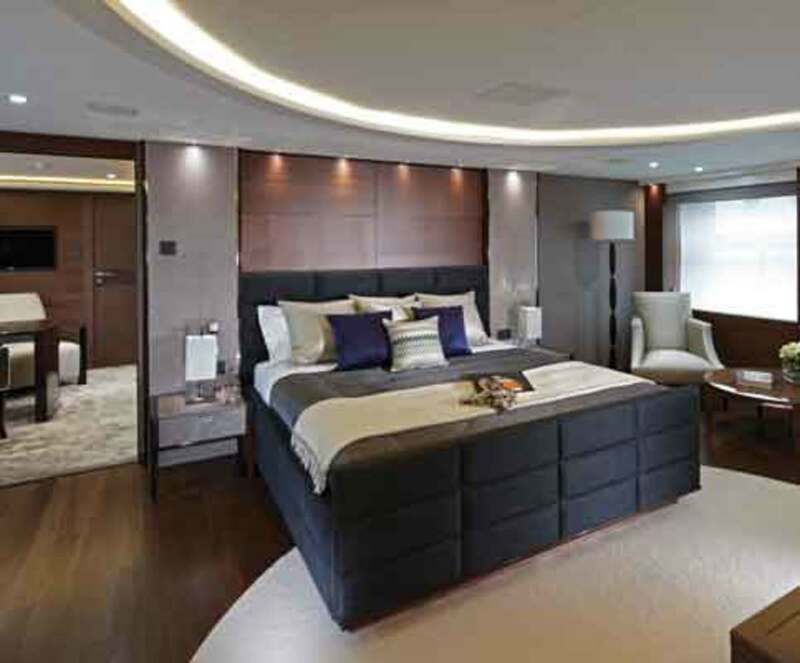 The full-beam master suite is 26 feet wide and takes pride of place forward on the main deck. With a floor area of nearly 600 square feet, it is exceptionally spacious. The room benefits hugely from big, bright windows that will give splendid views across an anchorage. An acid-dipped glass-panel screen separates palatial his-and-hers bathrooms with heated floors. The suite also features expansive walk-in wardrobes and an anteroom, which can be specified to suit an owner’s requirements. Aboard Imperial Princess, it is used as a study. The interior is themed throughout using satin walnut veneers and hand-stitched hides to complement the inlaid Macassar ebony cabinetry. 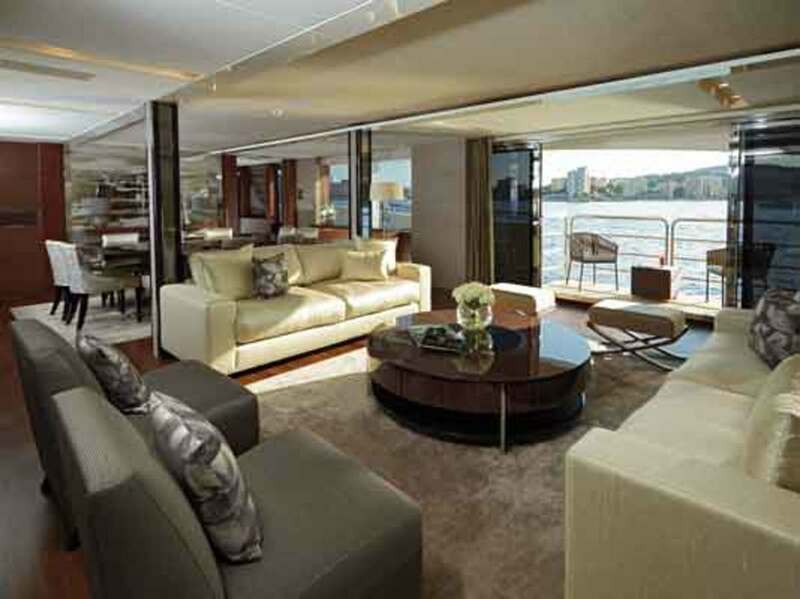 The décor of the soft furnishings here are, as elsewhere on the yacht, competently completed in many differing shades of gray (perhaps as many as 50 shades of gray). To starboard, a grand central staircase, whose wooden treads appear to float on a stainless steel spine, links each deck from the sun deck to the lower accommodations, while crew circulate using a more discrete stairway on the port side. 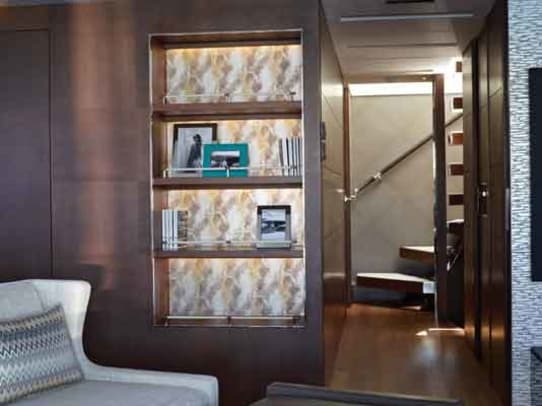 Space on the lower deck could accommodate up to five staterooms with ease. In the first build, just four cabins occupy the space. Forward, one double-berth cabin with two twins either side of the passage allows for the VIP suite to sit across the full beam farther aft. This delightful suite actually boasts more floor area than the owner’s stateroom. It is easy to see why the builder can offer the option to divide this cabin into two and replace one of the other guest cabins with a gym, study or even a cinema. Attention to detail and to comfort is evident throughout. Under-floor heating is used in all four guest bathrooms, and cabin bulkheads are finished in laser-engraved and embossed leather that cries out to be touched. The bridge deck is home to the wheelhouse, captain’s cabin and a pleasing lounge that features a unique piece of original art by Robert O’Dea, which covers the skylounge’s forward bulkhead. On deck, Princess gave equal attention to spaces loved by those who enjoy the outdoor life. The huge transom door opens to reveal the tender garage, which is decked with teak, creating a fun beach club at the stern, measuring some 170 square feet (easily big enough for deck chairs and loungers). Upstairs, the cockpit has its own bar, as does the upper deck, which also hosts a private salon and a spacious alfresco dining table. Capping it all, the sun deck boasts a bar, sunbeds, wonderful seating and a hot tub. 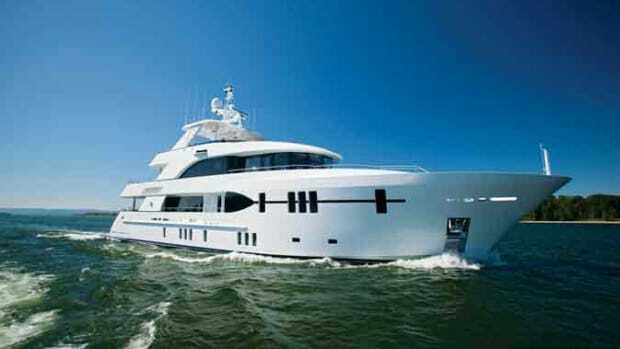 Powered by twin MTU V12 4000 series engines, each producing 3,460hp, the yacht is capable of speeds up to 24 knots. Superb seakeeping is augmented with an impressive cruising range of 1,500 nm at 12 knots assisted by engineered weight reduction and the latest infused molding to give Imperial Princess a displacement of just 230 tons. Ever mindful of publicity, Princess cannot resist pointing out that she is also the largest production yacht to date built in Great Britain. 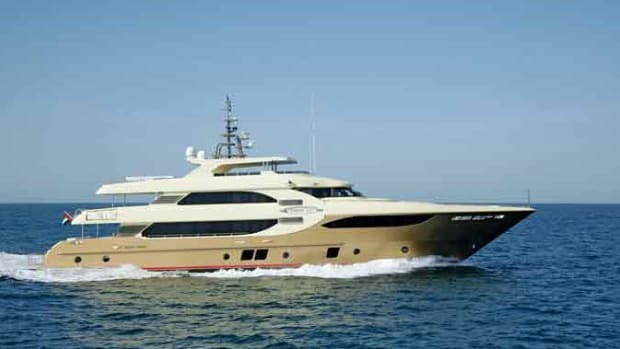 Founded in 1965, Princess Yachts International builds a range of sport boats and cruising yachts starting at 39 feet. In the past three years, Princess has joined the ranks of megayacht builders, with the launch of a 32-meter and the 40-meter. 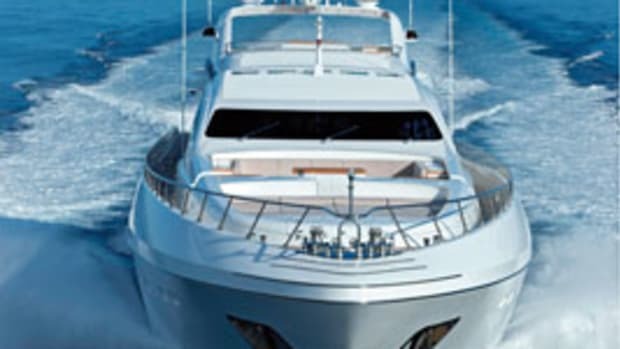 Paying a reported $320 million, luxury goods group LVMH (Louis Vuitton Moët Hennessy) and Groupe Arnault acquired the yachtbuilder in 2008, adding the brand to a grouping of more than 60 international luxury brands owned by LVMH, including Louis Vuitton, Christian Dior, Fendi, De Beers, Moët & Chandon, Veuve Clicquot and Krug. Other marine interests include Feadship’s Van Lent yards. Princess Yachts purchased an 18-acre yachtbuilding site within the secure Devonport Naval Base in Plymouth where it is building its new facility. When operational (by early 2013), the development will create or secure a further 1,000 or so jobs both directly and indirectly, according to a company statement. Princess Yachts is already the area’s second largest private-sector employer, with just fewer than 2,000 employees. About 90 percent of the production is exported outside of Great Britain.